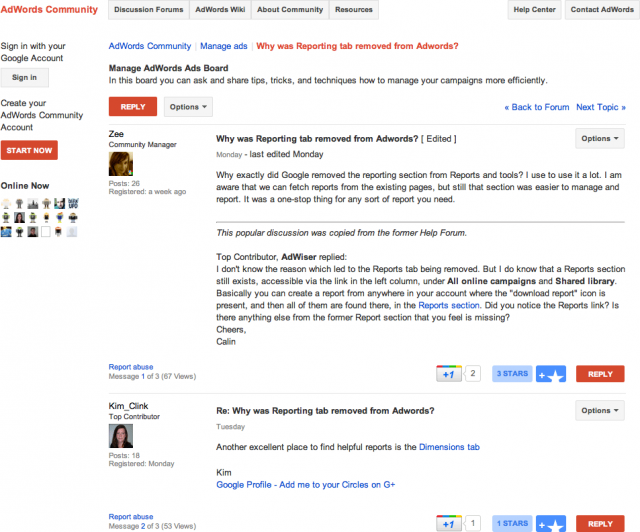 Google forums have begun to slowly migrate to the new Google Groups format. I personally do not like that new format, but Google doesn't always listen to me about my likes and dislikes, even with forums, despite me being of the most active trolls in the forums. Google AdWords representative, Zee, announced the switch over in the Old Google AdWords Help Forum and the New Google AdWords Help Forum yesterday. The thing is, this is not the new Google Groups format, it is very very different and at first glance, I like it a lot better than the Google Groups version. I like this format mostly because I can see by profile who said what, Google Groups does not have that feature. Plus, overall, it seems snappier and faster than Google Groups. Google Groups has a pretty significant delay on clicking around the threads, even on my super fast machine. Congrats on the upgrade AdWords folks! Forum discussion at Old Google AdWords Help and New Google AdWords Help. Previous story: iAds Drops Prices Increases Revenue Share: But Does It Compare To AdMob or Google AdSense?